I've been admiring the whole wheat pan loaves txfarmer has shown us in recent weeks. Her use of intensive mixing to achieve a higher rise and airier crumb has particularly intrigued me. (See SD 100% WW sandwich loaf with bulgur (cracked wheat) - discovered a new favorite ingredient). When I read her blog, I decided to make the same bread. However, on further reflection, I changed my plan. I have a favorite 100% whole wheat bread – that in BBA – and I really don't like the combination of sourdough tang and whole wheat flavors. So, I decided to fiddle with Peter Reinhart's formula for 100% whole wheat bread using some of txfarmer's techniques to see if I could get a lighter-crumbed version of a bread I already know well and love. The crumb texture I have gotten with this bread is moist but rather dense and crumbly, following Reinhart's suggestions for mixing time. This is not at all unpleasant to eat, but is very different from the airier crumb txfarmer and khalid have shown. Reinhart's formula calls for a soaker with a coarsely-ground grain and a whole wheat poolish. As usual, I used bulgur for the soaker, and I used fresh-milled whole wheat flour for the poolish. The flour in the final dough was KAF Organic Whole Wheat. The procedures described are those I used. They deviate from both Peter Reinhart's and txfarmer's in significant ways. The day before baking, measure the bulgur into a 3 cup bowl. Pour the water over it and cover tightly. Leave at room temperature until used. The day before baking, mix the poolish ingredients. Cover the bowl tightly. Allow to ferment until bubbles start to form (2-4 hours), then refrigerate. Mix the soaker and poolish, as instructed above, the night before mixing the final dough. One hour before mixing, take the poolish out of the refrigerator to warm to room temperature. Place all the ingredients in the bowl of a stand mixer. Let the dough rest, covered in the mixer bowl, for 20-40 minutes. Switch to the dough hook and mix at Speed 2 until a medium window pane can be made. (20-25 minutes) Note: Reinhart's instruction is to knead for 10-15 minutes, “less” if machine kneading. Transfer the dough to a lightly oiled bowl. Ferment for two hours or until the dough has doubled in volume, with a stretch and fold on the board at 60 minutes. Divide the dough into two equal pieces and form them into pan loaves. Place the dough into lightly oiled medium loaf pans and place the pans in food-grade plastic bags or cover well with a towel or plasti-crap. Pre-heat the oven to 350ºF with a rack in the middle. 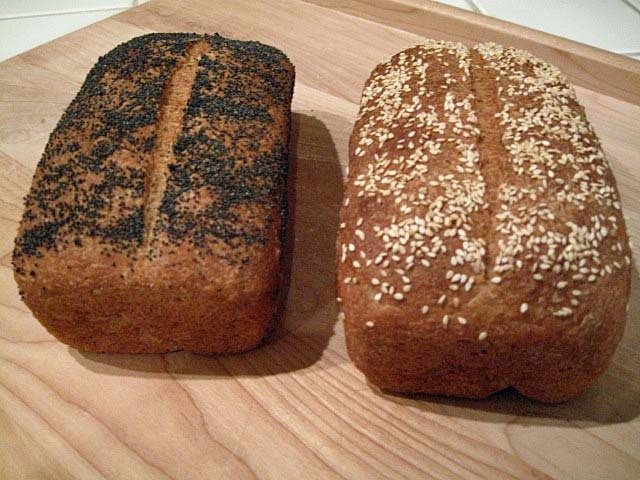 Optionally, spray the loaves lightly with water and sprinkle on seeds or rolled oats. Immediately transfer the loaves to a cooling rack. I noticed two significant differences in this dough, compared to my previous bakes of this bread. First, the dough was less sticky than usual. Second, the loaves achieved significantly greater volume during proofing. I attribute this to the more intensive mixing, but also the S&F which serves to further strengthen the dough but also equalized the dough temperature and redistribute the products of fermentation. 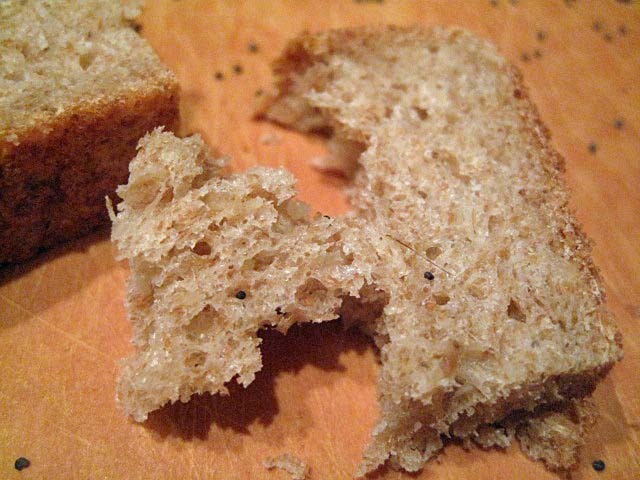 The flavor of the bread is basically unchanged, but the mouth feel is entirely different - light and mildly chewy. I was amazed. I'm looking forward to having toast for breakfast. Thanks, txfarmer, for your inspiring and informative postings! Very nice! I can see a significant difference in the crumb texture, so glad that you liked the result! I'm very pleased with the result. Thanks for your demonstration of the intensive mix effects. There is a lot to note here. High level of mixing is probably of greatest significance. It took me a while, but I worked out the hydration in the final dough was just over 66%, allowing for 75% moisture in the egg, but not taking account of any in the honey. That is slightly lower than I would often achieve, although a perfectly good level, and important as it has helped encourage extra mixing. The use of the cold poolish must also be important, maybe also, the rest after forming the dough [almost a mini autolyse, but not quite]. Obviously it depends on the mixer used; I believe you have a Kitchen Aid. We have 2 of the modern Kitchen Aids in our bakery kitchen, and I don't really think very much of them. They work at high speed, with a really poorly designed hook, imparting significant frictional heat, without any real intensity of mixing. I gather their older models are much more robust. Did you record the final temperature of your dough as it came off the machine? I wondered how significant you think enzyme activity is in your experiment? The first breads suggest high amylase activity, not evident in the second dough. Also, use of extra protein from egg in the final formula will bring greater strength to your dough, plus some improving functions from the honey and oil. Nice formula! When the term "bulghur" is used over here, we would be using the more refined product, as shown in this link to an American website: http://www.sunnylandmills.com/bulgur_wheat_about.shtml It's different from the cracked wheat used by txfarmer. Thanks very much for your comments, Andy! I do have a KitchenAid mixer. The best thing about it is that I'm familiar with it's behavior. It is remarkably inefficient compared to the large spiral mixers I got to use at the SFBI. I also have a Bosch Universal Plus. There is a lot I like about it - especially it's power and capacity for larger doughs, but it doesn't give me the visual cues that the KitchenAid does regarding dough consistency and development, without actually doing a window pane. I didn't check the dough temperature. i don't have any thoughts about amylase activity. I can't think of why the same formula with a less intensive mix would have higher enzyme activity. Would you care to elaborate? I'm intrigued. Re. the formula: I do like it. I've wondered about using buttermilk rather than water for the soaker. What do you think? The bulgur/bulghur in your link appears to be identical to what I buy locally, except what I get is a darker brown. We have a very large Armenian community where I live, and the company that produces bulgur locally has been here for almost 100 years, I believe. I don't know if they still dry it after cooking by spreading it on the factory roof to dry in the sun. That's the traditional method. The bulgur I can get from other American sources is inferior to the local product, in my chauvinistic opinion. The finer grind is used in tabbouleh. The medium and coarser grinds are used in pilaf. Bulgur pilaf is a personal favorite, especially with lamb. I could go on about the various bulgur pilaf variations. I'll spare you. Anyway, thanks for your kind words and input. I was using your description of the first dough, along with the appearance of the crumb in the photo. Both seem to suggest high amylase activity. I didn't mean to infer that the degree of mixing might lessen amylase activity. Many thanks for clarifying on your use of bulghur. I don't get to use buttermilk much, so can't really advise about its use in a soaker. It may give you a little more acid to balance out the sweetness some tfl posters note in Reinhart's formulae. Wonderful Results, David! Beautiful open crumb, and crust! Success! You have just demonstrated a domestic made bread improvers, egg yolk as an emulsifier, Honey as sweetner, oil as a dough conditioner, poolish as a gluten improver.. I think that your freshly milled wholewheat in the first loaf was a high percentage of your flour. Chances are that the milled grains where ground in one pass, resulting in more damage in starch, thus more amylaze activity, as andy said. in the second loaf, you used the freshly milled flour (which naturally contains more amylaze enzymes) in the poolish, instead of the final dough, which reduced total amylaze activity. What a wonderful loaf you've baked! toasted this bread is excellent with anything! When I grind WW flour, I actually do 3 passes - the first on a medium setting, then 2 at the finest setting. I'd like to get some WW flour which has the bran milled extra-fine. This should give an even more open crumb. What Txfarmer calls "shredable" I call "strandy". Your post gives a good demonstration of how to achieve it with 100% whole wheat. For better or worse, I have no mixing machine. So I use the lazy way of getting strandy wheat bread--I use 50% white flour. Your bread looks very good to eat. Before making this bread, i looked at Hamelman's WW formulas. They are 50/50 BF/WW. I've never made them but should give one a try. I think you could achieve the same effect hand kneading, but it would take a lot of kneading. 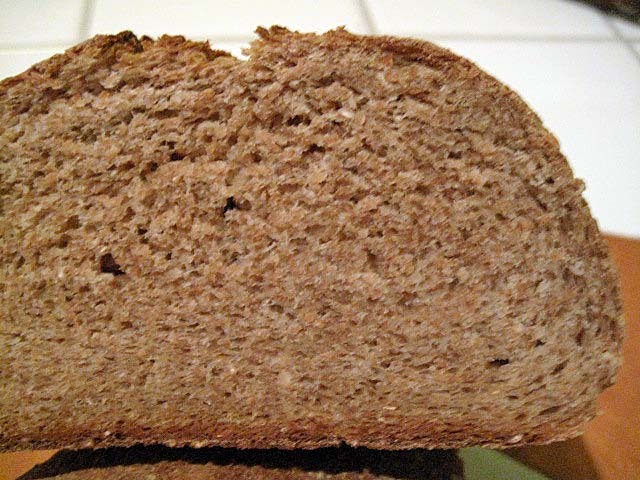 David, our favorite soft sandwich bread these days is Hamelman's Oatmeal Bread, which has only 25% whole wheat but a nice whole wheat flavor and a wonderful strandy texture (even hand kneaded). Now that you mention it, I did make Hamelman's oatmeal raisin bread once. It was very tasty, but I was comparing it to the BBA Cinnamon-Raisin-Walnut bread, and it lost. I've not made it without raisins. What a lovely crumb. Thanks for sharing your nicely written formula, David. Your crumb has such a lovely and tasty looking appeal. The bulgar they carry is the coarse cracked. I hope to bake your bread sometime in the future and maybe sprinkle it with some wheat flakes for top garnish. I took a photo of both..the cracked wheat on the Left, coarse cracked bulgar on the Right. Thanks to David, txfarmer and Andy for posting about Bulgar, i now have a lot of uses for it. I think I'll increase the dough hydration next time, FYI. I've seen bulgur that looks like the pile in your photo (on the right), but what I prefer actually looks more like the cracked wheat (on the left). I will have to check some of my other local stores for different grinds...it is coarse, I think it would soak up nicely, but the smaller cracked would work very nicely in bread....I need to use the correct my spelling of bulgur ;) I like the way Andy spells it too! I hope to get more baking time, but not for a while. I just looked again at the link you posted. Did you realize that Sunnyland Mills Bulgur is what I (and brother Glenn) grew up on? And this is the bulgur I used in my WW bread? Fresno, home of Sunnyland Mills, is what Glenn refers to as our "ancestral village." I just used the link because I thought it offered a really good representation of what I understood Bulghur Wheat to be. Did you note, by the way, that the poster boards in the old 1935 photo on the website spell out "bulghur", but in 1995, the "h" had been dropped? I'm a big fan of tabbouleh. I was a founder member of a Vegetarian/Vegan Cafe/Restaurant back in the late 1980s. This was a really popular salad. But, I've never got beyond rice for use in pillaos, and tend to go with Indian as opposed to Middle Eastern styles too. I love to use organic brown rice, and particularly basmati brown rice too. Makes me fairly unusual, I guess, but I like my wholegrains, and have done for a lot of years. Looks like a really great family firm. as they say. And your photos, David, make absolutely clear the difference in the outcome of the two mixes. Hard to believe that's a 100% whole wheat loaf. I agree. The crumb is remarkable. The dough is not only whole wheat, but the poolish flour was not fine-ground and there is the soaker to mess with the gluten strands as well. A very interesting comparison of whole wheat mixing you have here. At the supermarket where I work we make a 100% whole wheat bread that looks almost identical to the crumb on your loaf. I've found over the years that whole wheat needs extensive mixing in order for it to be 'machinable' or in other words to be able to run it through our bread divider. The divider part of the process is literally the sticking point of the production cycle. If the dough hasn't been mixed to the point where it will flow, (as I call it) or is the least bit stiff, it simply jams in the conveyor belt tunnel that carries the dough to the intermediate proofing carousel. To give you an example, this morning I scaled out a mix using 60 Kilos of whole wheat flour, the yeast, salt etc at a hydration between between 60%-61%, put our spiral mixer on 1st speed, set the timer for 15 minutes and took a coffee break. When I returned, the dough was soft but not sticky, and the colour had lightened considerably. This lightening of colour is one of the things I look for to tell me the dough is nearly ready. It had another 5-6 minutes on 2nd speed to finish the development and then I ran it through the machines with no major problems. The other benefit is that the dough will mold so well it's difficult to tell where the actual seam is in order to pan it correctly. When we mix our 100% WW in this manner the crumb result is always soft and shreddable, very similar to your own fine example. I make a similar loaf modified from the BBA Multrigrain bread. I've played around with the soaker a lot and have arrived at a mix of bulger, steel-cut oats, flax seed, millet, and whatever else appeals to me at the time. The flax seed adds a really nice color and texture variation. 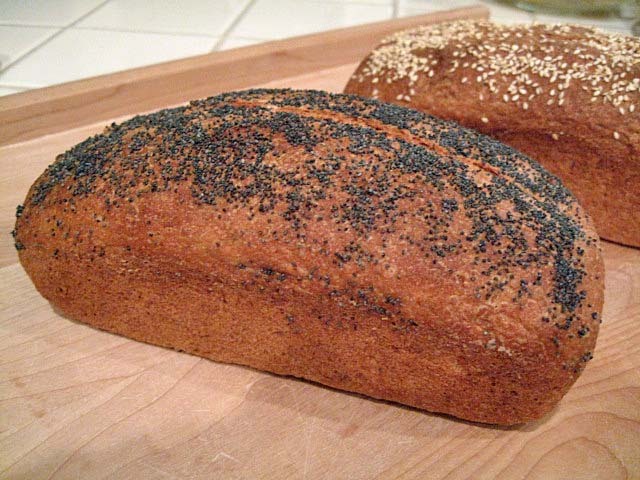 I haven't made this bread with other soakers, but I like the idea of adding flaxseed. Nice bake, David. The difference between the two crumb shots is quite remarkable. Having a stand mixer really helps with this type of technique. I know from experience that hand kneading a dough to that kind of development ( whlie possible) is very tiring! Thanks david for demonstrating that the intensive mix method is applicable too to pure WW bread. Was grateful to txfarmer for her sourdough pain de mie post. It nearly killed my old mixer but the final crumb was a nice curious mix of soft yet strong. Now there is your even healthier formula to try. Always on the lookout for breads for me dad with the dentures. hi!! I have been trying not to use yeast at the moment for personal reasons. i am still a bit amateurish but would it be possible to replace the instant yeast in the poolish and the final dough to sourdough? If possible, what other alterations should i makr and maybe complications that might happen? Thanks so much! It looks wonderful!!! You certainly can substitute a liquid starter for the poolish. Just keep the total ingredient ratios the same. However, it will be an entirely different bread. Not bad, just different flavor and texture. me. The water and the milk in the linked SD version are missing in this one for some reason? Am I missing something? txfarmer based her recipe on one from Laurel's Kitchen. Mine is based on Reinhart's from BBA. Mine has all the water in the soaker and poolish. No milk. Well, there is a bit of water in the egg white. My effective hydration is about 60% in this formula. and said the bulgar would soak up all the soaker liquid and the WW in the poolish would soak up all that liquid leaving the egg and honey to supply the liquid for the dough flour and it isn't enough....I don;t even do white bread at less than 68 -70% hydration and WW ones never less than 80-85%. WW at 60% still sounds very low but I'm in the desert and parched bread should be welcome here:-) I haven't made this recipe yet but the crumb is putting it to the top of the list. Good thing it is made in a mixer since you couldn't slap and fold this mix! 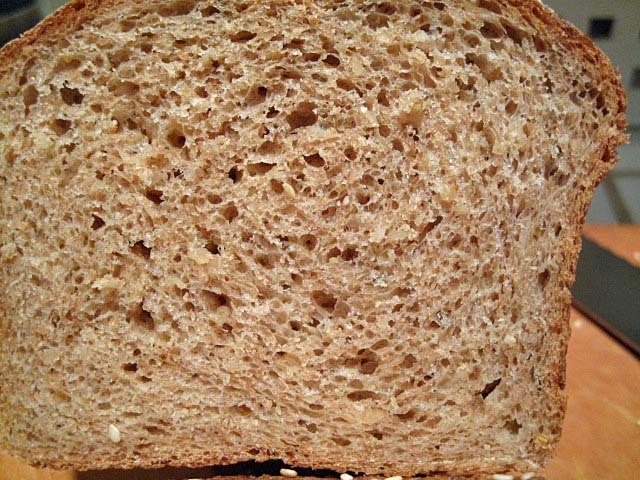 Amazing the crumb you got with this low hydration - just points out how important intensive mixing is. I would have thought the same, but I would have been wrong. This dough is way drier than almost any I have made, but I have made it many times, and it is anything but dry once baked. One thing to note: The trade off for the lighter crumb is loss of flavor. All the negative effects Calvel found in intensively mixed baguettes are present in intensively mixed WW bread too. The saving grace is the flavor contributions of the enrichments. However, I happen to really like the flavor of well-fermented WW bread, and a lot of that gets lost with intensive mixing. Another thing to note: I haven't made a commercially yeasted WW bread since the ones in the OP. Currently, I am working on PiP's WW Levain. I made in last week and goofed badly by not reading my own instructions correctly. But I could taste the potential deliciousness. for 5 years I'm guessing it is because the flavor was less than satisfactory - per your post. The reason I say that is because that is the 1 reason I don't make a bread again - it didn't taste good - which is the most important thing in my book. Who knew a puny home KA could make the bread flavor disappear with intensive mixing! I though you only had to worry about that with real commercial mixers in a bakery. Another reason not to use the thing. Maybe Lucy will dream up something else to keep me out of trouble taste wise. I've been wanting to make a whole grain, sandwich SD bread with some amount of sprouted, multi-grain flour and sprouts folded in. I'm pretty sure that one would be tasty. Maybe I will make one at a higher hydration and the same bread with intensive mixing and see what the difference in crumb is , hoping most of the flavor stays put.